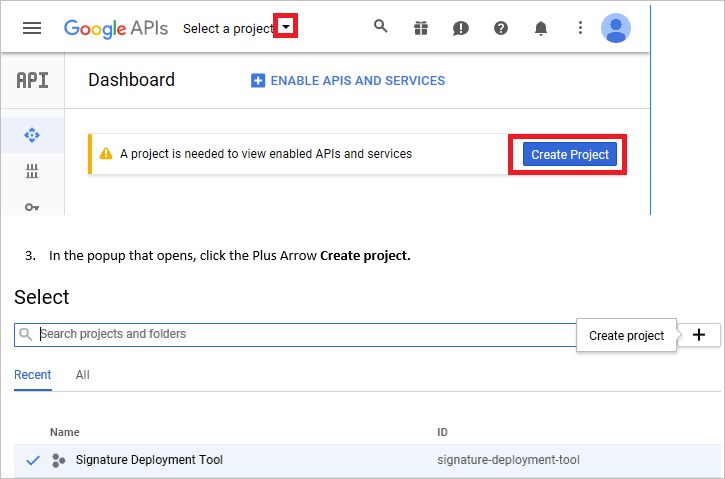 Configuring Google Apps signature deployment requires enabling API access from within the Google Apps Admin console, running the Google Apps Signature Deployment Assistant to set the API keys, and then deploying the generated configuration settings to users of the Signature Deployment tool. The Google Apps Signature Deployment Assistant generates an encrypted configuration file which will need to be deployed to all users who require Google Apps signature deployment. In smaller environments, this could be done manually, however in larger environments, we recommend the use of a logon script or third-party software deployment tool. Browse to https://console.developers.google.com/apis/credentials and log into the Google Apps Admin console using administrator credentials. In the popup that opens, click the Plus Arrow Create project. Name the project Signature Deployment Tool. Click Create. You should already be on the credentials tab but if not select the key icon on the left to open the Credentials tab. Click the Create Credentials button and select OAuth Client ID. Select Other as the Application type and enter a name for the key, for example, Signature Deployment Tool Other. In the displayed list of OAuth 2.0 client IDs, click the name of the client ID you created. The Client ID and Client Secret which are required in part two are displayed on this page. Launch the Google Apps Signature Deployment Assistant from the Start menu and enter the Client ID and Client Secret from step 7 above. Click OK to continue. Note the warning if the process is re-run, existing clients with old configuration files may no longer be able to deploy to Google Apps until they receive an updated configuration file. In the browser window that opens, sign into Google Apps and agree to the authorization request. Copy and paste the Access code that is displayed in the browser window into the Access Code dialog box. Click OK.
• If the Signature Deployment Tool is installed in User Mode, copy the GoogleAppsConfiguration.xml file to the %ProgramData%\DynaSend\Signature Deployment Tool folder. • If the Signature Deployment Tool is installed in Admin Mode, copy the GoogleAppsConfiguration.xml file to the user’s %APPDATA%\DynaSend\Signature Deployment Tool folder.